The Ecosse International seems criminally overlooked on the vast majority of travel sites. Whilst not as cool or sophisticated as its boutique rivals, this 3-star guest house in the bonny Bonnington district of Edinburgh enjoys a mellow and charming character, suitable for couples and small families alike. The Filipino owners, Ossie and Erlinda add a pinch of ‘pinoy’ pizzazz to the traditional Scottish hospitality. A terrific little budget option with all the necessary room perks to make it a comfortable stay. 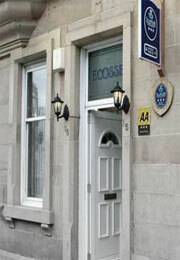 The hotel can be found 10 minutes south of the city centre near Queen Street Gardens and Pilrig Park.